If pop culture history had run a slightly different course, this tire might have been called the Sneezing Panda or the David After Dentist. 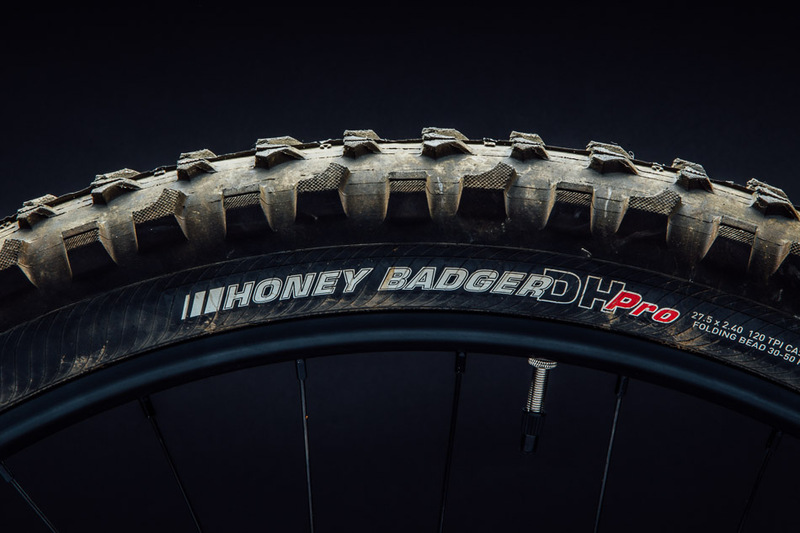 But the name Honey Badger makes so much more sense, especially for Kenda's thick-skinned Honey Badger DH Pro. The 2.4-inch-wide offering is available in four unique combinations of Kenda's various casing and rubber options. We tested the sealant-compatible version of their Light Gravity Casing, paired with their 42/50 compound, which is softer than the 50/60 compound of their time-tested DTC. How much softer? 8 softer on the sides and 10 softer in the middle. Duh. 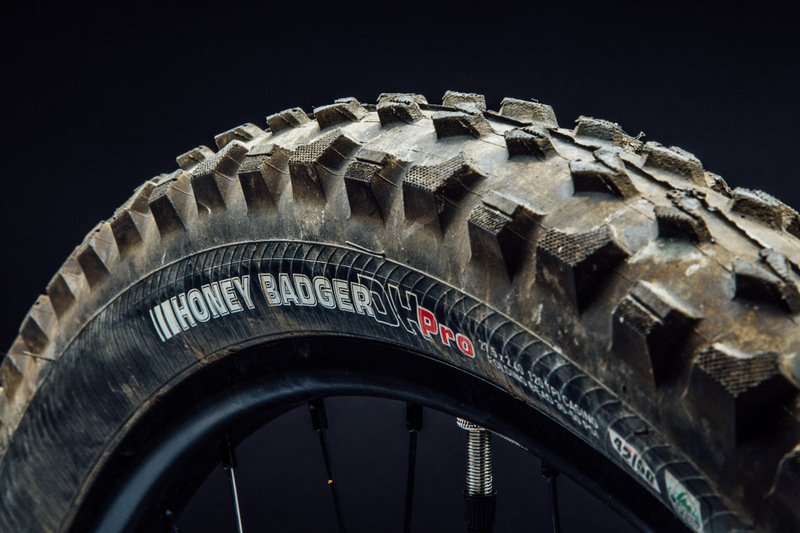 The tread pattern was redesigned for the wider, tougher DH Pro. The staggered center knobs of the original Honey Badger have been traded for side-by-side pairs of its signature ramped triangles. This combines the paddle concept of other leading gravity tires and the efficiency and mud-shedding capability of sparse individual ramped knobs. Also borrowed from popular DH tires are the side knobs. Alternating squares and L shapes have flanked most of our favorite aggressive treads ever since we first saw them on the Maxxis Minion. There's a reason certain patterns keep popping up in tire design. They work. The Honey Badgers seem to have just the right mix of old and new concepts. I rode them in conditions that varied only as widely as a Southern California summer would allow, but our slippery, sandy slopes are uniquely well suited for exposing any tire's strengths and weaknesses. As a rear tire, I found myself wanting more grip during straight-line braking than the Honey Badger offered. I appreciated its efficiency in smooth, hard conditions, but it wasn't worth the compromise in descending traction, especially when not in conditions wet enough to clog the wide, flat knobs of a traditional paddle tire. I had no such complaints on the front tire, though. Having ridden several tires using Kenda's DTC compound, the 42/50 was noticeably more trustworthy and will have a much longer lifespan than than their ultra-soft Stick-E compound. In addition to its grip in the corners, the tire's casing was resilient, even when run slightly below its recommended minimum 30 PSI. On slow, crawling descents, it held confidently to every precious edge. If your dirt is dry, run it on the front. If it's wet, run it on both. Do what you want. Honey Badger doesn't care.